Spaghetti Bolognese is something my kids request all the time, however I am not a huge fan of it, neither is my husband. Here I have found a recipe all five of us enjoyed. The kids loved it, and me and my husband were pleasantly surprised to find we enjoyed it to. 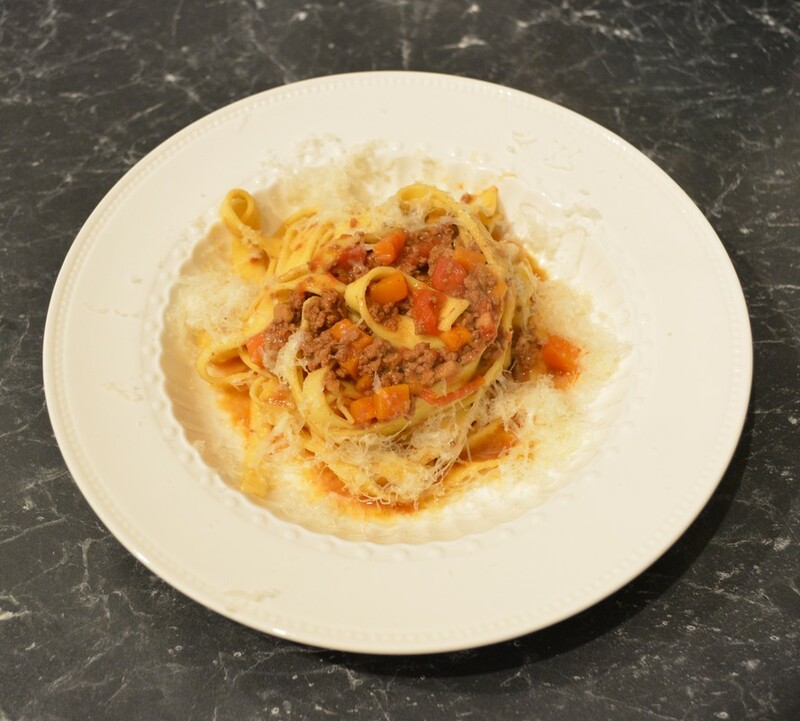 Now I have yet to find a quick Bolognese recipe that I have liked, so this one is a slow cooked one, as I find the flavours are always better when slow cooked. Feel free to double the recipe if you need to, or want to, but you may need to cook it a little longer, so just make sure you allow yourself a little more time. With this recipe I have mixed the sauce into the pasta before I served it, something my mother has done my entire life. She believes the pasta tastes better when the sauce gets absorbed into the pasta, I have to say I prefer it this way also. So when I hear a chef say the same thing, I am quite impressed with my mother who grew up in an era where there were not a multitude of cookbooks available, nor could she google something like we can today. Once you mix the sauce into the pasta, leave it for 5 minutes so the pasta can absorb some of the sauce. 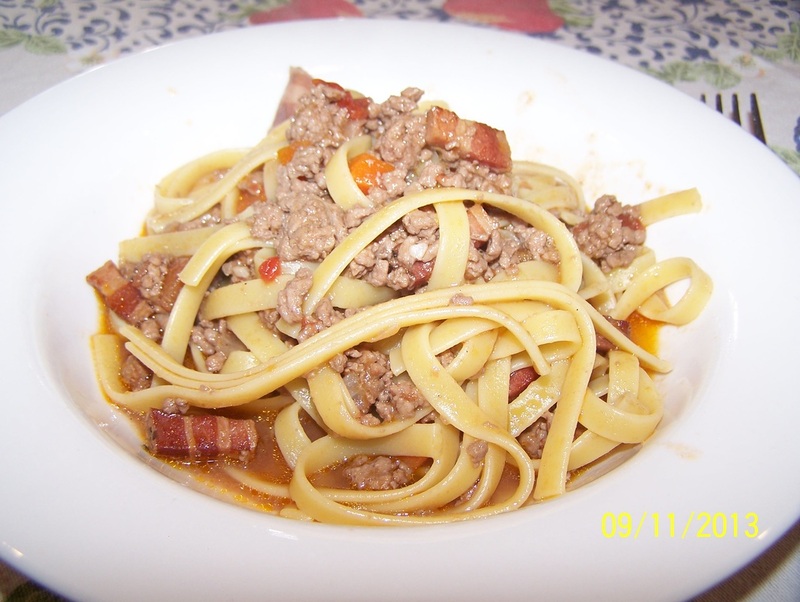 This Bolognese although has tomatoes, is not really strong in tomato flavour. My other Bolognese sauce I like to make for instance uses twice as much tomatoes. This one has a light, yet delicious flavour to it. The sauce is thinner because of the fact that there is less tomatoes to thicken it up. So you just need to cook it until you like it. In the photo below you can see the sauce was a little watery, I should have cooked it a little longer, but truthfully, no one cared, as it was still delicious. So just remember to cook the sauce until you have reached the thickness you like. Also I used a combination of pork and veal mince rather than using beef mince, as I find it has a better flavour, you can use either. Adapted from James Martin's Cookbook 'Masterclass"
Place a large heavy based saucepan over high heat. Add the oil and pancetta and fry, stirring, for 2-3 minutes or until browned. Remove with a slotted spoon and drain on some paper towels. Set aside. Reduce the heat to medium-high heat. Add the butter, onion and carrot, fry, stirring, for 5 minutes, or until the onion softens. Increase the heat again to high, add the mince, fry, stirring, breaking up the lumps for 5-6 minutes, or until the mince has browned. Add the stock, tomatoes and pancetta. Bring back to the boil, reduce the heat to low, cover, simmer for 1 1/2 hours. After 1 hour of simmering add some salt and pepper. After an hour an a half of cooking, remove the lid and see where the sauce is at. If it is too liquid, continue cooking uncovered for another 30-60 minutes. This part will be completely up to you. Shortly before the sauce has finished cooking, cook your pasta. Once the sauce is done, check seasoning once more. Stir the sauce through the pasta. Allow 5 minutes for the pasta to absorb some of the sauce. Serve.